Chikku is one of the best delicious and healthy tropical fruit cultivated in huge quantities in India, Pakistan and Mexico. This Chikku fruit is commonly popular as sapodilla or sapota or sapote. This tropical fruit contains many healthy vitamins, minerals and antioxidants. Vitamin A contents in ripe delicious chikku fruits take care of vision, lung and oral health even at the old age also helping to enjoy younger happy life. Vitamin C natural medicinal property in Chikku is useful for maintaining healthy and shining skin texture. Eating this delicious and healthy seasonal fruits will develop body resistance to fight against many infectious diseases throughout the year and rich in iron helps improve HB. 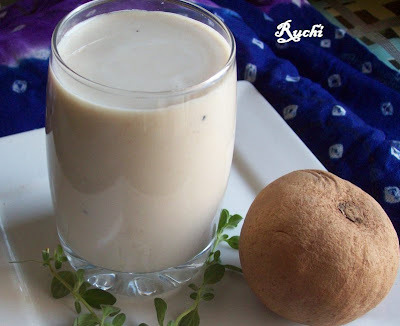 Chikku milk shake prepared with ripe and fresh chikkus after removing outer skin and inner seeds are very popular health diet and popular for its unique taste and serves as a perfect n quick filling breakfast. Remove the skin and seeds of the chikku, and cut to small pieces. 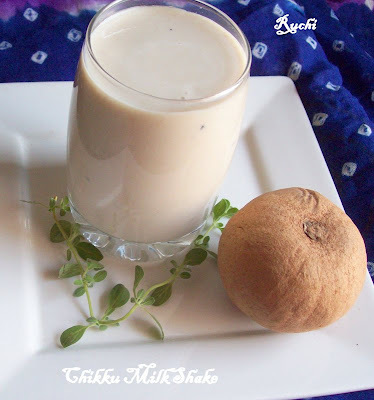 Blend Chikku pieces, sugar and milk in a blender. Blend until very smooth and Pour it into a glass and serve chilled.. Enjoy the flavor of this delicious Milkshake! Wish to finish this shake rite now,unfortunately we rarely get fresh chikkus here.